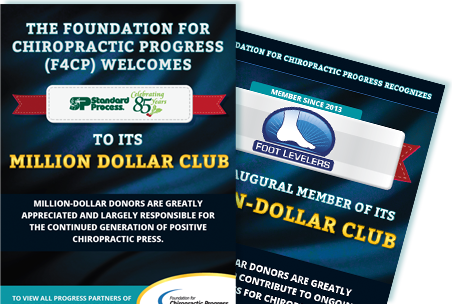 Proudly recognizing members of the F4CP Million-Dollar Club for continued support of positive press for the chiropractic profession. and help fuel ongoing positive press for the chiropractic profession. Standard Process Southwest Nutrition, Inc., Standard Process Southeast, Inc., Standard Process of Pennsylvania, Inc., New England Nutritional Services, Inc., Standard Process of North Texas Inc., Standard Process South, Inc., Therapeutic Nutritional Services, Inc.
Standard Process of Kansas-Western Missouri, Inc., Mid-Atlantic SP Nutritional Resources, Inc., Standard Process of North Carolina, Inc., Standard Process of Central Texas, Inc. There are those from our chiropractic family who have passed on and would be very pleased with the progress of the chiropractic profession. Chiropractic healthcare was a big part of their life and contributions in honor of them are made to support continued progress. Remembering those from our chiropractic family who have passed on and would be very pleased with the progress of the chiropractic profession. Chiropractic healthcare was a big part of their life and contributions in honor of them are made to support continued progress...A minimum of $120 ( $10 a month for twelve months ) for a legacy contribution.